Hi Jennifer and Suzanne, I couldn’t have asked for better coordinators for the most important day of my life. You two have been wonderful from the beginning of my planning. You understood my vision and executed it perfectly. I was absolutely blown away, as we’re my guests! This was our first time coming to Cabo and didn’t know what to expect, especially for having our wedding there. I met a lady on the flight over and she was there to get married as well. She told me she came out 3 times to check everything out. She thought I was insane to put my trust in a company that I’ve never worked with before. But like I said, from the very beginning Suzanne and Jennifer answered every question, every concern and assured me it will be amazing. Ant that’s just what it was. From picking the venue to picking up the equipment the day after the weddng, they have been nothing short of wonderful. As soon as I receive your photos I will send them to you. 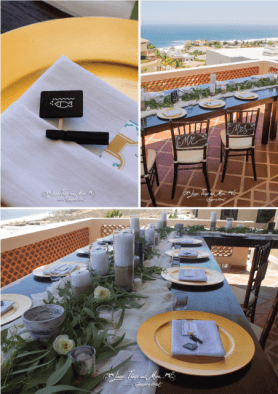 Jeremy and Julia – Villa Amanecer – June 25th, 2016.